The Reliable Controls Lighting Interface Modules provide the ability to switch Douglas 'HID' or General Electric 'RR' series relays directly from Reliable Controls MACH-System universal outputs. Each module supports two inputs and outputs. Separate modules are available for Douglas and GE systems. The module takes a digital 12 V signal and provides a 24 VAC pulse to the latching relay of the system (both on and off). Power for the Lighting Interface Modules is supplied by the MACH-System output; no external power supply is required. The Douglas Lighting Interface provides relay position feedback. Both modules are conveniently mounted in standard 3.25" snap track to provide a low-cost lighting integration solution. To find a dealer in your area please see the Sales Locator. 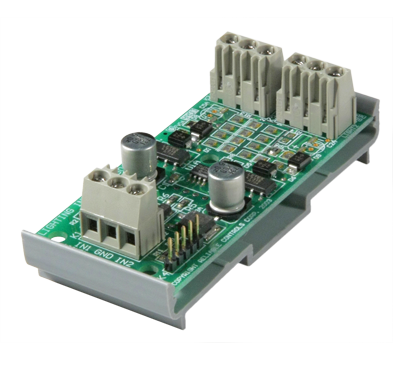 For more information on the Lighting Interface Module please see the Products Page.